Alexa Guard can turn dumb smoke detectors into smart ones through sound-recognition technology. An Echo listens for sound in AWAY mode, can contact security monitoring center through ADT Pulse or Ring Alarm. Amazon Echo and other Alexa-enabled devices already do a good job understanding and acting upon human voices. But these same devices have been woefully underutilized as audio analytical tools – recognizing and responding to such sounds as fire alarms, dogs barking, babies crying and grandma falling. Welcome to the new era of voice assistants as security and wellness tools, starting with Amazon’s Alexa Guard, a service that recognizes and reacts to three distinct sounds (for now): smoke alarms, carbon monoxide alarms, and breaking glass. Announced yesterday, Alexa Guard will send an alert when one of these sounds is detected, although it is unclear if Amazon would alert users directly through an Alexa app or only through third-party solutions providers. Two of those initial providers are ADT (via its Pulse security and home-automation system) and Amazon’s own Ring Alarm. When a user tells Alexa they’re leaving, the system will activate the Guard mode, listening for the three sounds and messaging the subscriber upon an alarm event. In the case of ADT, at least, the user can listen to the event through the ADT Pulse app, and then opt to forward the recording to ADT’s central monitoring service for further action. ADT subscribers also could elect to have the alerts, including recorded audio, sent directly to the central station, spokesperson Jason Shockley tells CE Pro. “The launch of the Alexa Guard feature for Amazon’s Echo smart speakers is an exciting moment for sound recognition." ADT (NYSE: ADT) stock rose 7% on yesterday’s news. The Guard service requires no new hardware for Alexa products, just new algorithms – the likes of which have been implemented in numerous other listening devices over the past several years. CES 2015 marketed the begging of mass-market audio analytics for the smart home, with at least a dozen companies announcing new IoT products that would listen to “dumb” smoke/CO detectors and alert the user via text or email. CE Pro named audio analytics one of its Top 5 Home Technology Trends for 2016. Many (or most) of today’s popular consumer products endowed with this intelligence use technology from UK-based Audio Analytic. In response to CE Pro’s query, the company said it could not comment on the technology behind Alexa Guard. In addition to sound recognition, Alexa Guard can automate lighting scenes when the user is away. The system will learn lighting patterns through Alexa-connected devices, and replay those patterns in a randomized fashion to make the house look occupied. CE Pro reached out to ADT about Alexa Guard. The security giant would not get into the nitty gritty (Does it integrate directly or through the cloud? Through Alarm.com?) but spokesperson Shockley did explain that this latest collaboration marks of “deepening” of the relationship established with Amazon in 2017 when ADT launched Alexa Skills for Pulse. The comment is interesting, given that initially the service will only work with ADT Pulse, and all Pulse accounts are already monitored, by definition. “Is Guard enabled in other ADT-monitored solutions?” I asked. If ADT intends to use Alexa Guard to expand its subscriber base, we would presume it would open up new subscription options, for example, through a direct connection from the Alexa device to the central station, bypassing a traditional security panel and service like Pulse (via Alarm.com). ADT has enabled such implementations in the past through its Canopy API, announced in early 2016; however, after an initial flood of Canopy partners -- Ring, Kidde, August, Wink, SmartThings, Roost and LG, for starters -- we haven’t heard much about the initiative. Not that I expected a “yes” from ADT, but I did inquire if an Alexa Guard alarm event could open up a two-way line of communication (or listen-in mode) between the central monitoring station and the premises in question. Obviously, the answer was no, but we can imagine the Echo devices might allow this feature in the future. Today, most major security brands enable the feature through their security panels, but typically the customer has only one or two intercom-enabled security keypads in the home. In a household with multiple voice assistants, the monitoring station should be able to virtually follow an unwelcome guest throughout the home. 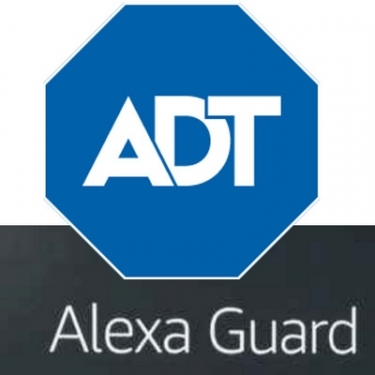 Since ADT is not commenting at this time about technological aspects of Alexa Guard integration, we don’t know for sure if the detected sounds can trigger other events through the ADT Pulse hardware or Alarm.com service. It would make sense, for example, to turn on lights in the home or bring up video cameras on the user’s app when the Guard discerns a suspicious sound – just as Pulse might do when a traditional glass-break sensor is tripped. We are only just beginning to see the power of audio analytics in Amazon’s new service. Again, we don’t know if the company Audio Analytic is providing the technology for Guard, but the provider already offers (or is in the process of developing) additional sound-recognition services for dogs barking, babies crying, cars honking, people talking, doorbells ringing, and visitors knocking on the door. The company also can discern audio anomalies – unusual sounds that occur in places or at times they shouldn’t. The prospects for using sound to monitor wellness – of people, not just the premises – are real. In another blog about the smart home and assisted living, Audio Analytic suggests sound-recognition technology could be used to “detect prolonged or repeated coughing or sneezing, providing early indicators of poor health and alerting the carer/occupant, offering advice, turning on air purifiers or tracking activity in an appropriate app.